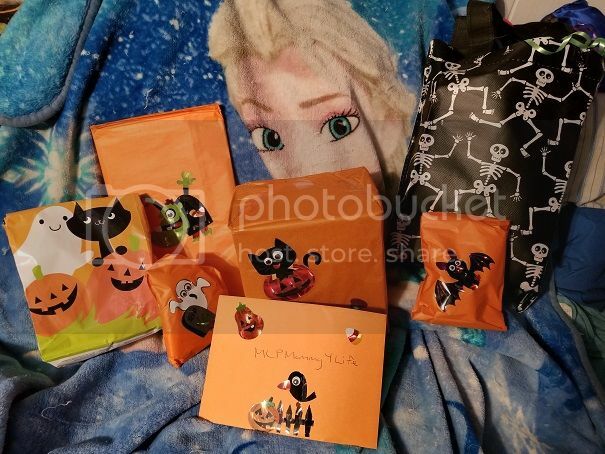 2018 MLPTP Halloween Swap Brags! Last but not least! Lovely Snuzzle to add to my 35th Anniversary collection Thanks so much for a great box! I love everything! That looks like a an awesome haul! I love the little Itty Bitty. So cute!! And Snuzzle!! I'm so happy you got everything and you like it all! 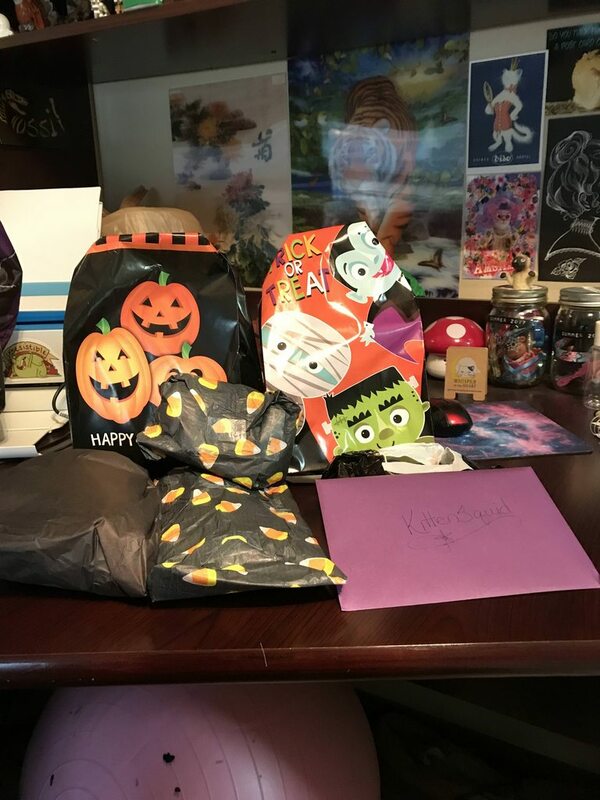 Sorry I sent yours out so early, I just wanted you to be able to get the most usage out of your Halloween goods as possible! I may have had a case of blind bag/box fever lol. Happy Halloween!!! And of course, there are the ponies. 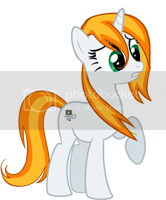 :3 Skybreeze managed to find three adorable G4s for me! Thank you SOOOOO much!! This is my first swap here as well and I am looking forward to participating in more group events in the future. Ahh!! My box came today. At first it confused me a lot since I wasn’t expecting anything from @Ology until a later time. Then I slowly clued in. 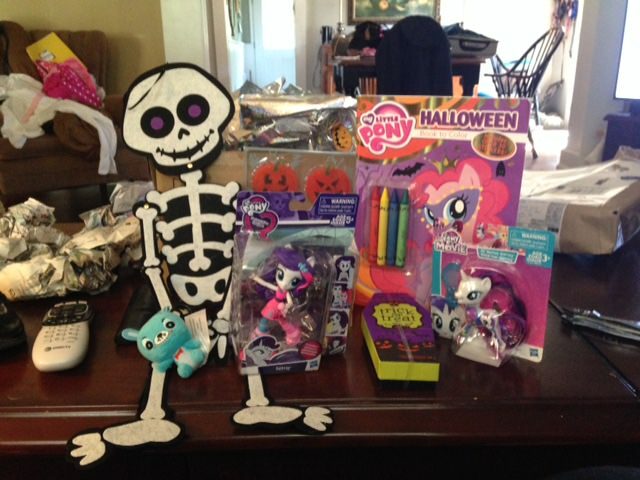 Here’s my awesome Halloween haul (and my precious cuddle pony in memory of Lola). Please also excuse my sewing/rerouting mess that is also in the pictures. I opened everything on my work area. @Skybreeze I am so glad it got there so fast. Glad you like your stuff. you must tell me what figure you got? I hope you enjoy the tea its my favorite. I got Malfoy! Lol I love the look of displeasure on his face. I need to collect all these now and put them on the HP shelves in my room. I’ve been so good with resisting them but dang they are awesome. Got my swap box from @Uftaki today . 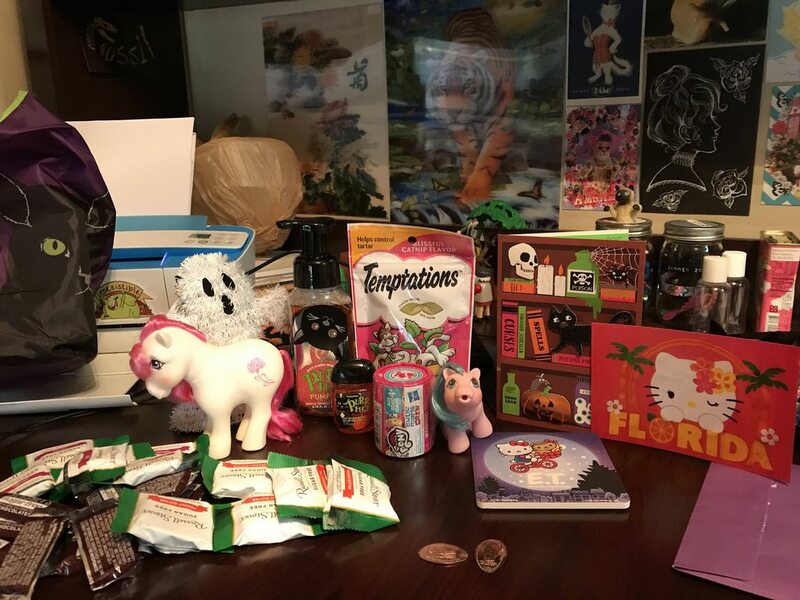 Thank you so much I love the ponies and the other stuff. You all got some reall nice surprises!! Everypony did a great job! WHat a great group of loot! One of these days I need to join in, but I'm so disorganized, I worry I won't make the deadline! 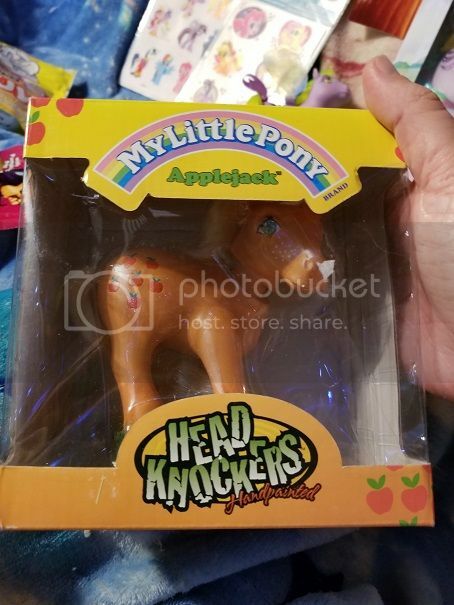 I've been running around picking up some amazing pony finds this week. I was sorting my loot and heard a knock on the door yesterday. I was so happy with my box from Gingerbread. A much needed lift to my spirits. Can we talk about the super fun Nightmare Before Christmas lights? I wish I could load the video I took. They blink and play the theme song. So cool. 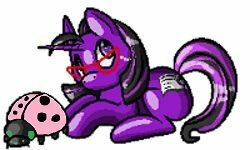 I love my new ponies and I've already eaten too much licorice. Yum. Cute sparkle-y pumpkin socks, with matching glittery jack-o-lantern earrings, a Snoopy Halloween magnet and pumpkin lip gloss, how awesome is all of that! Yummy treats from a place called Marks & Spencer. Chocolates and blackcurrant & cola gummies. All super yummy!!!!!!! That’s an awesome group of loot!! That VT with her accessories is gold. She looks stunning. And you got MARKS & SPENCER GOODIES!! Omg!! How I’ve been craving some sweet sweet delicious yummies from M&S. 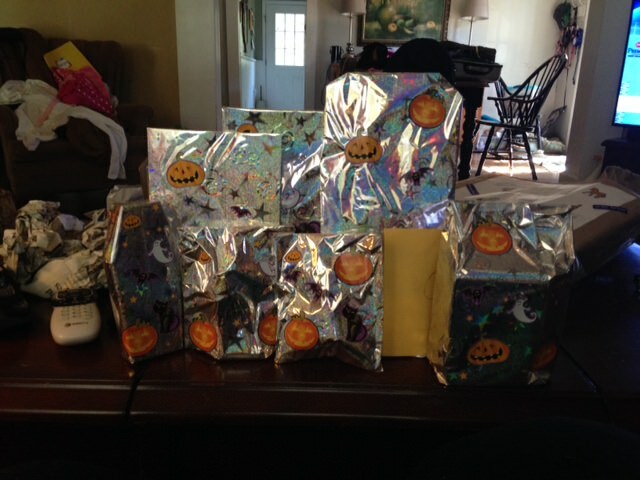 And all the great spoopy wrapping!!! 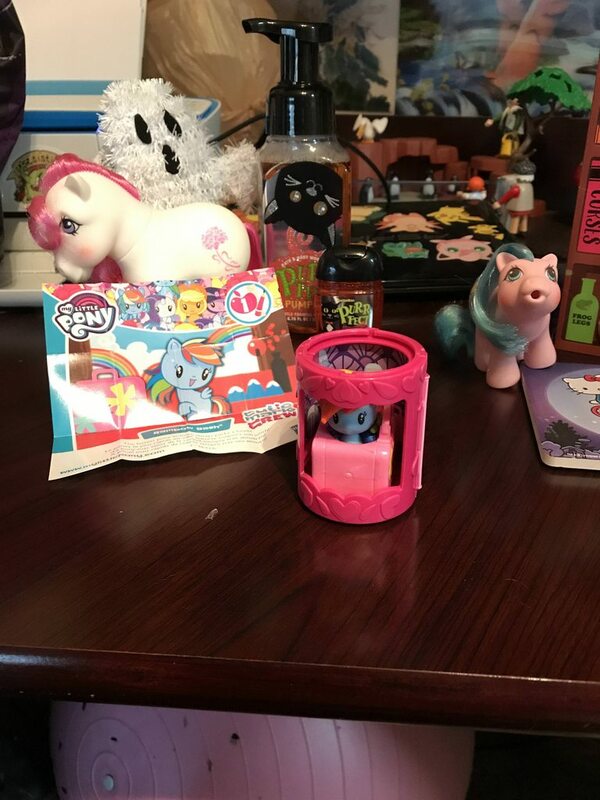 @MLPMommy4Life you really spoiled me! 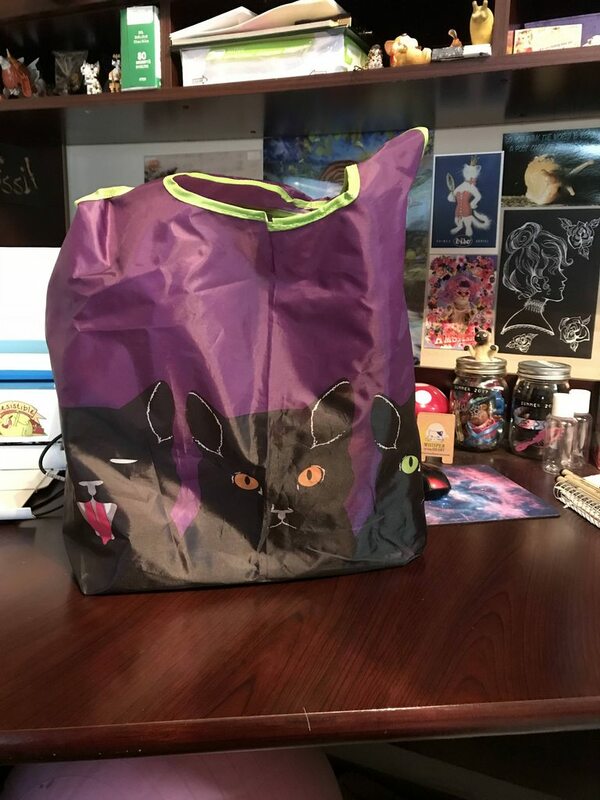 I mean, there's treats for me AND my kitty! And some wonderful Hello Kitty pressed pennies from Universal Studios, as well as an awesome coaster! And just look at those ponies, I'm so excited to have such beauties in my collection! Thank you so very much, you really made my whole day!!! 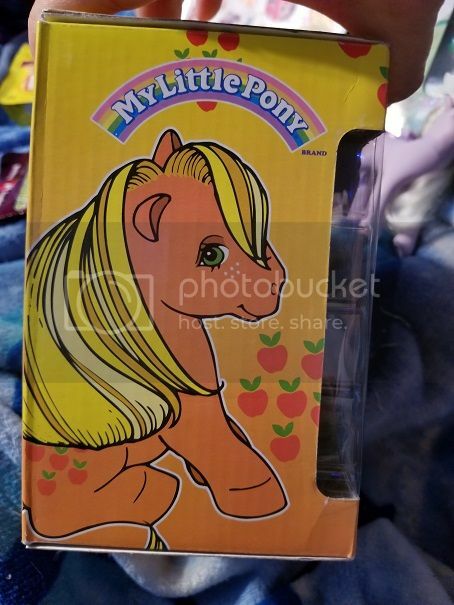 The coolest pony to ever jam herself into a lunchbox! 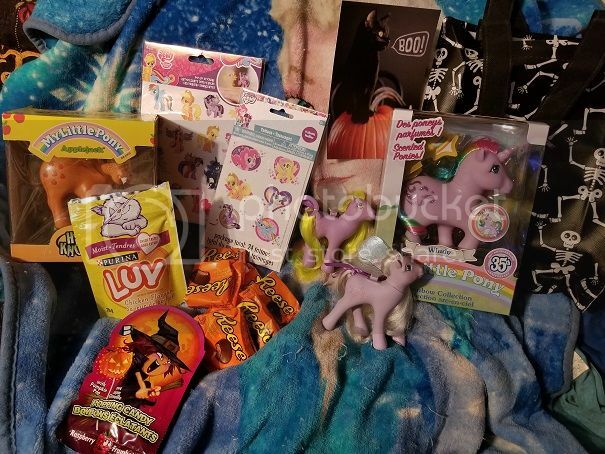 Thanks again so much, @MLPMommy4Life you really made my Halloween special! You are so welcome, @kittensquid !!! I'm last... I've been so very busy....I'm just now getting to my computer long enough to post mine in my next post, but you are so welcome! As soon as I saw "Hello Kitty" on the list, I knew where I had to try and go because we spend every weekend at Universal in October, LOL! The coaster and the pennies were the least expensive things in there! I had a difficult time deciding on which coaster to buy. It was between Jaws, Back to the future, jurassic park and ET. I thought they were all great, but you can't go wrong with ET for sure. 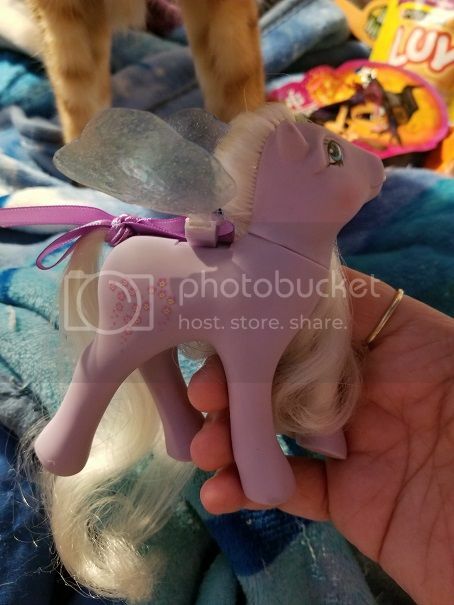 I was really worried about the birthflower pony cause of the neck seal. Was that okay? (It was not mentioned in the auction) I'm SO relieved that everything arrived safely, especially the coaster. 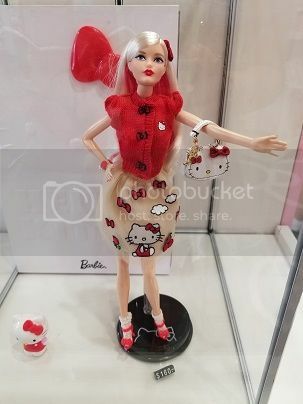 By the way, I meant to include this photo of a really awesome Barbie I saw at Universal, and I forgot. I know you'll appreciate her twice over. I managed to save some of these stickers and remove them from what they were stuck on. Others, I saved by just cutting around them. They're different, and I loved them! This was the gem of the swap box. I've never seen this item before. I kind of knew they were out there from collecting circles like here and other places I'm on on FB, but I never had the pleasure of seeing one! Now I own one! She's so cool! I think I sat with my mouth open for a good minute before remembering I had more to open... LOL! 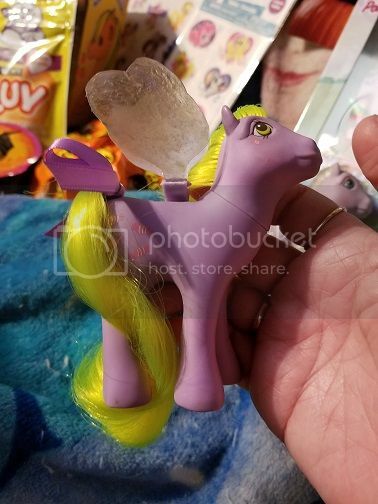 My second favorite things of the box... flutter ponies with special homemade wings! Thank you SO much for these little ladies! I've missed seeing flutters with wings!!! Forget-Me-Not is a replacement because my original is in dreadful condition. I *love* this whole box! She found Windy!!! 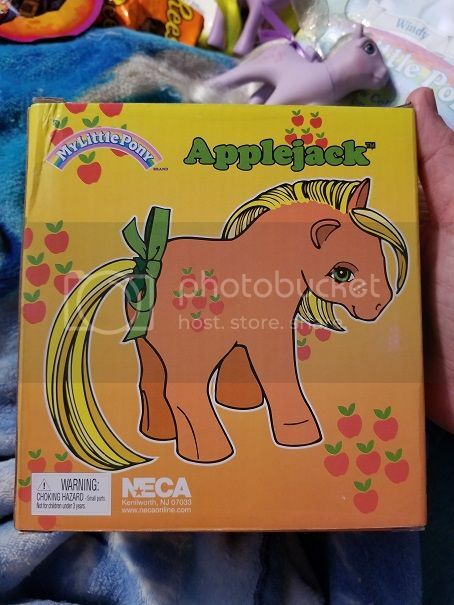 So I have a French-Canadian pony to go with my American ladies! My rainbow set is complete! Thank you!!!! Also, I got Canadian Peanut Butter cups.I love how the wrappers are slightly different in that they simply say "Reese" and not "Reese's" .... I'm enthralled by the simplest of things, I think! 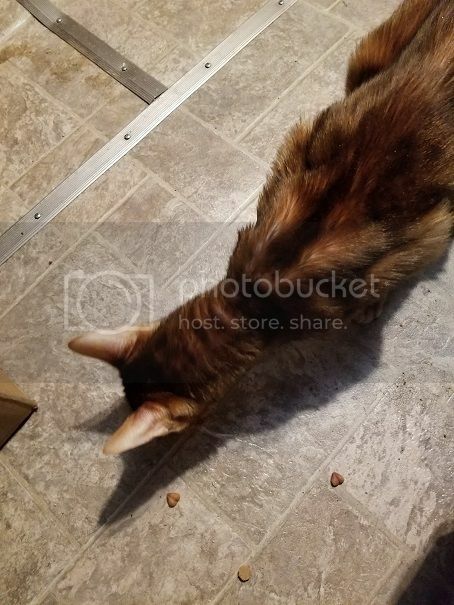 By the way, Tucker loves his french kitty treats! They're soft, which is so very perfect for my little old man. 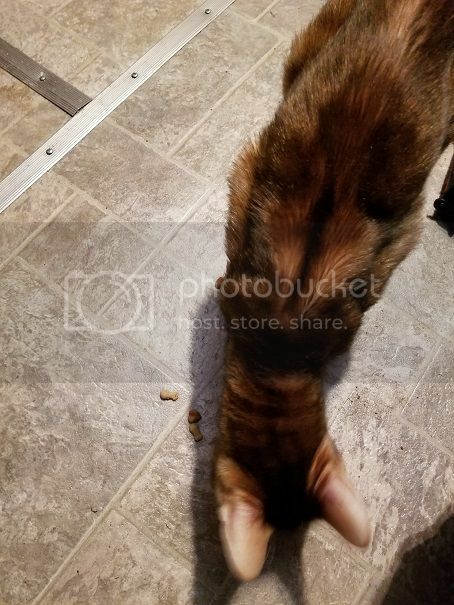 My other two, younger kitties are hot and cold on treats in general, but Tucker lives for them. He says, "Thank you for thinking of mommy's kitties!" Here's a couple of him actually scarfing them up! He loves them!!! 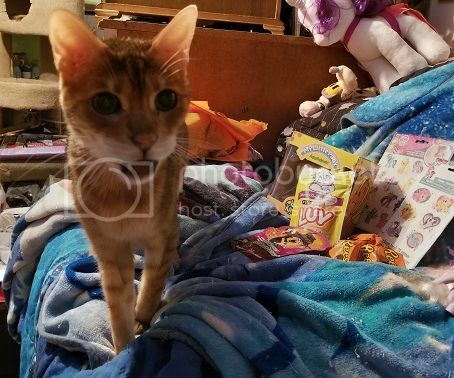 Thank you SO much for my whole box! Everything was amazing! I felt so spoiled! Happy Halloween!!! !